Michael Johnston is a senior analyst at All Emerging Markets. 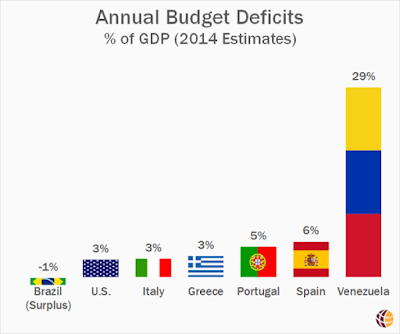 He has an article up today explaining current challenges facing the worker's paradise in Venezuela: A Visual Guide to Venezuela's Failed Economy. 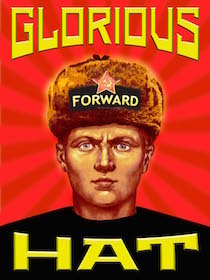 This is a great status report for anyone interested in the spin-off effects of socialist policies. While he covers many areas of the Venezuelan economy and conditions on the ground there, his main point is the country's 94% dependence on oil. 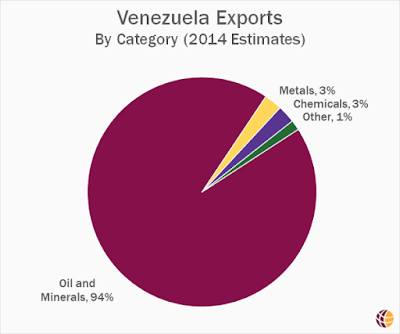 Like Russia, but even more so, Venezuela's nationalized economy runs parallel to the price of oil. You'll pick up a lot of good information in this article, such as the 6-month timeline it takes to start a business there, their 27% inflation rate since 2005, or this: a comparison of Venezuela's deficit to some of the worst on the planet. While one can assume violence increases in a decline, I was shocked at Johnston's data for Venezuela. The country is sporting a very high 54 per 100k murder rate. 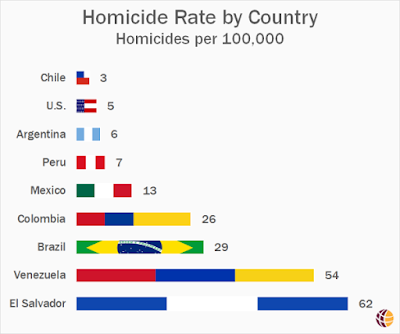 And worse, Johnston informs us that "the police killing rate in Venezuela is more than twice the homicide rate in the US." More proof that liberal progressive communist inspirations ALWAYS lead to more suffering and death.